We would like to thank everyone who helped contribute to the success of our performances of Tony Harrison’s ‘The Mysteries’ on March 31st, 1st/2nd April 2011. Whether you were actively included in the production, you advertised for us, watched the show or prayed for us – we are very grateful. We are also very pleased to announce that initial figures show that we did indeed make a profit in spite of essential costs undertaken. We do have a selection of photos on display in church and copies can be ordered, at 50p each, up to Easter Sunday. The profit so far is £750.52. Thank you again very much indeed for making this show a success for the participants and the church but especially for the Lord. So many people remarked that they enjoyed special moments during the show. In company with all parishes we need to raise money to cover the daily running costs of the church. We have regular events to help with this, along with the generosity of weekly giving and donations. You can see us at the Downton Cuckoo Fair in May where we transform the Memorial Hall into a cafe for the day – St Laurence’s Larder. This has proved popular with visitors who make a point of coming back to see us each year. We start with breakfast, then lunches and finish with afternoon teas. Always something for everyone. Another annual fundraiser is our Church Fete where we not only enjoy the abundance of colourful stalls but we are entertained by local dancers, schools and the Downton Band, as a rule. Our fete is held on the last Saturday of June each year – so please pencil it in your diaries!! In the past we have held Christmas bazaars also, which although they have proved successful, in 2010, we tried something totally different. 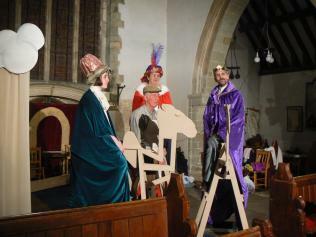 A Michaelmas Goose Fair was held on Saturday 11th September in the Church. The second Goose Fair, held in St Laurence Church on 24th September, 2011 was a great success again this year. The day began with a procession through the village of children from the Primary School, together with supporters, dressed in traditional costumes, singing and encouraging people to “Come to the Fair”. The Fair was officially opened by our senior member, 101 year old Mrs Florence Corbin, who is still an active member of the St Laurence congregation. The church was filled with stalls - selling a wide range of beautiful local crafts and delicious produce - together with exhibitions of wonderful art and exquisite quilts. Delicious home-made refreshments, including Pat’s very popular game pie and coronation chicken, were available for lunch from traditional serving wenches. The whole church was filled with a bustling crowd in a very happy atmosphere. It was a great opportunity to open up the church to the whole village community. Also, of course, we were very grateful to raise some much needed funds for the church. The Goose Fair was very well received and attended and made around £1350.00 for general church funds. Thanks to all who helped and all who visited. We also need to raise HUGE funds to pay for the church’s replacement heating system that we now enjoy. For more details and our Mission Statement please see the St Laurence’s Trinity FUNders page.